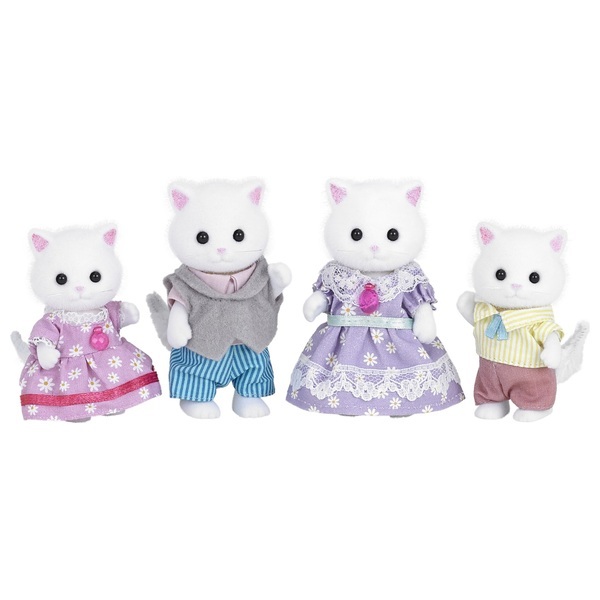 Collect all the members of the Persian Cat family with this Sylvanian Families Persian Cat Family Set. Father Arthur Teak just loves collecting furniture and his favourite carpet is the centrepiece of the beautiful Teak Family living room. Arthur can’t help but collect pretty brick-a-brac and antique furniture, from teacups to vases. He has a particular soft spot for carpets as there are so many wonderful designs! Mother Cecilia, sometimes affectionately called ‘Bo’, loves designing dresses so much that she opened her own boutique. She has a wonderfully large wardrobe and is always encouraging little Nora to borrow her clothes and accessories, although Nora is not quite grown up enough for them to fit her yet! From fabric to frills, Cecilia loves all things fashion and fun! You couldn’t ask for a better friend than Felix Teak and he’s known around Sylvania for being incredibly kind; but shhhh… don’t tell anyone that he’s afraid of heights. Popular with the Sylvanian girls becausee has such as warm heart, Felix has a knack for picking out the perfect gifts for friends and family because he’s always listening when they say what they like. He’s not keen on climbing trees though because he starts to get wobbly when he looks down at how far he’s climbed. Pretty-in-pink Sister Nora is rather good at doing make-up and making her friends look extra nice. She thinks that her mother is the most beautiful of them all, and often picks out a dress because she thinks that her mother would like it. She’s got plenty of tips for applying make-up from her mum and is constantly trying out new fun looks. She loves to look at her mother’s clothes and can’t wait to work in the boutique one day designing her own creations.